We’re all familiar with ICON’s Derelict series of cars, right? They take ratty old vintage cars and modernize the crap out of them while leaving the charming archaic look. 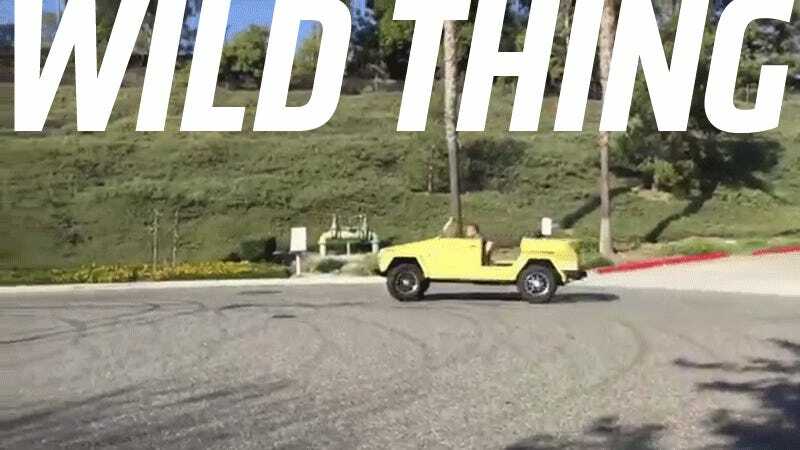 They’ve done it again, this time with an old ‘73 Volkswagen Type 181, which was evocatively called the Thing here in the U.S. They’ve converted this Thing to all-electric power, among many other modifications. They call it the Wild Thing, which sounds way better than Wild Type 181. Inside, I got to sit down with Jonathan Ward, founder and chief designer at Icon, and talk to him about why he founded the company, what he wants to do with it, and, more importantly, pitch him ideas for other cars to give the Icon treatment to. Incredibly, he and I had the exact same idea for one of these. That’s the first time anyone in the business of making cars has totally agreed with one of my inane ideas. That idea was an Icon VW Thing. But watch the video, anyway, and look at these pictures of the Icon factory, why not? Wow, look at that! An idea, realized. That’s a beautiful thing. Another beautiful thing is this beautiful Thing. The car has its original paint, which is impressive, but nearly everything else has been gone over, improved, and rebuilt. The all-new electric drivetrain, built in conjunction with Zelectric, perhaps the leading converter of old air-cooled VWs to electron-power, makes 180 horsepower and 210 lb-ft (150 Nrp), a pretty significant jump over the original car’s 46 hp/71 lb-ft (50 Nrp), which is why the car earns the “wild” designation. All those electrons are stored in a pair of battery packs, one in the front trunk and one in the rear luggage area, effectively consuming all of the dedicated luggage space in the car. The interior is still roomy and for two or even three people with luggage it’s likely fine, but if you want to use the trunks anymore all you can really pack would have to fit into a couple zip-lock bags. The real jewel of the restomod has to be the LCD instrument panel, which was specially designed to resemble the original instrument cluster installed in the Thing. It uses the same clean Futura font VW favored at the time, and it shows EV range, power usage, and all manner of technical details that the designers of the original gauge would likely just do a spit-take if you tried to explain it to them. It’ll even charge the 40 kW of batteries from a Tesla charger, if you need a reason to swap your Model X for something much, much cooler.